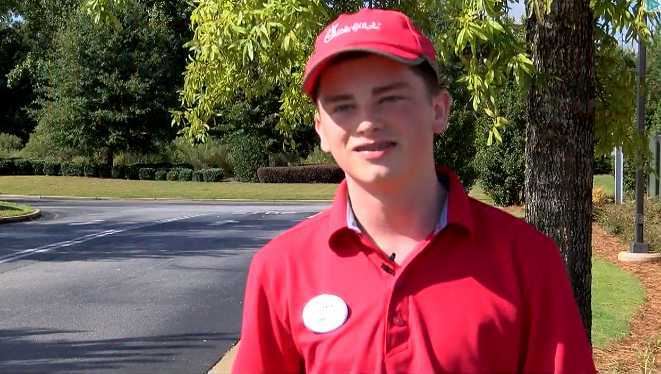 COLUMBUS, Ga. — An employee at a Georgia Chick-fil-A is giving the glory back to God after he recently gave a homeless man his shoes. Levi Jones, 18, who works at the Columbus location, told local television station WBRL that he saw the man, named Walter, sitting under a tree in front of the restaurant and felt led by God to talk him. After bringing the man some food, Jones felt led of God to give Walter his shoes. However, he wondered whether or not the shoes would even fit. Jones said that he believed God sent Walter there for a reason, so he took his own shoes off his feet and gave them to the man. It turned out that they wore the same size. Jones then walked back into the restaurant without any shoes. His manager gave him a spare pair for the day, but they were four sizes too big. He didn’t complain. According to WBRL, Walter told Levi he is a father-to-be, and that he wants to name the baby Levi after the young man that helped him. The station also reports that Jones recently paid for a family’s meal with his own debit card after the woman’s card wouldn’t go through. He then wrapped his arms around the woman and her children and prayed for them.